Here at Mobile World Congress on Tuesday, I got some hands-on time with HTC's newest smartphones, the Desire, Legend, and HD Mini. I also got to play with the spruced up Sense user interface, which will run on all three phones. Overall, I was quite impressed: HTC is truly one of the top phone manufacturers when it comes to design and build quality. The revamped Sense interface offers some useful new functions for easy navigation including a new feature called Leap. Essentially, Leap is an elegant way of handling multitasking; it's actually a bit reminiscent of Palm's webOS deck of cards visualization. Pinch anywhere on the homescreen, and you'll jump to seven thumbnail versions of your open pages. From there, you can go to any of those open applications or close out of one. 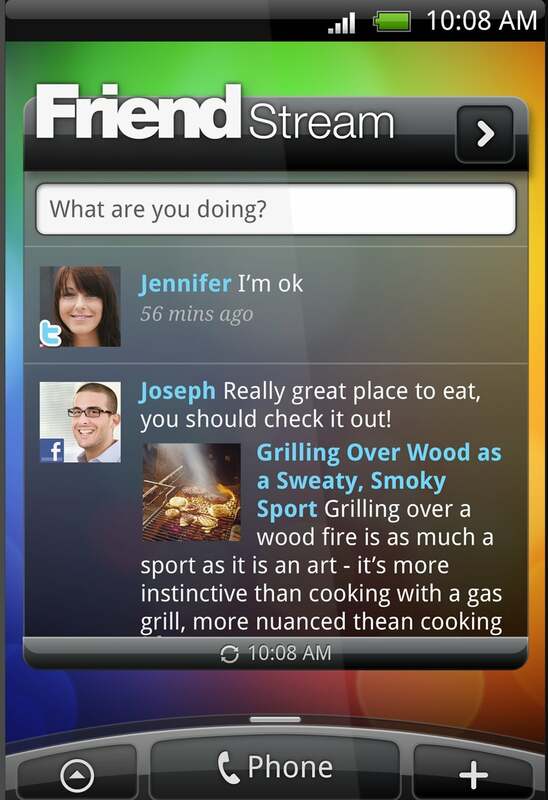 HTC also is jumping on the aggregated social networking bandwagon with a new widget called Friend Stream. It allows you to view your friends' status updates, shared links, and pictures all in one seamless view. Supported social networks include Twitter, Facebook, Flickr, and others. I find these social network feeds a bit annoying, but I suppose if you're an avid social networker seeing all of these updates in one place is useful. You can also tap and drag to highlight a block of text and either look up a word in a dictionary or translate it via Google Translate--pretty nifty. 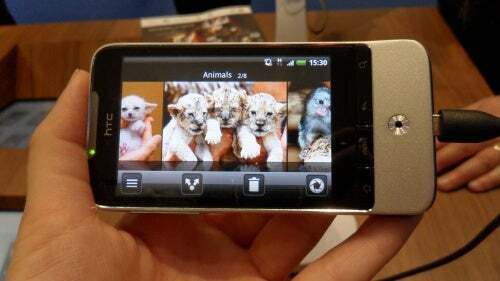 The successor to the popular HTC Hero, the Legend is a solidly designed phone. Shaped from a single block of aluminum, the Legend has a seamless, smooth surface with separate front and back pieces. You could drop this thing and it wouldn't dent (maybe). The Legend has a gorgeous 3.2-inch AMOLED display, which is an upgrade from the Hero's 3.2-inch LCD screen. The display nicely showcases the new HTC Sense, which runs over Android 2.1 (Eclair). Like the Hero, the Legend has a 5-megapixel camera, which took pretty decent photos inside. The HTC Legend will be offered exclusively from Vodafone for a time starting in April. Almost identical to the Google Nexus One, the HTC Desire boasts a 3.7-inch AMOLED display, a 1-GHZ Snapdragon processor and slim full-touchscreen design. There are a few key differences, however, in the hardware. Like the Legend, the Desire trades the trackball for the optical trackpad. The HTC Desire also has an FM radio, which the Nexus One lacks. While the Nexus One has four touch keys, the Desire has four physical hardware keys running along the bottom (Home, Menu, Back, Search). I actually prefer the Nexus One's touch keys, though, as it gives the phone a more streamlined look. The Desire is just a bit heavier than the Nexus One--it weighs 4.76 ounces as opposed to the Nexus One's 4.6 ounces--but is still slim and pocketable all the same. 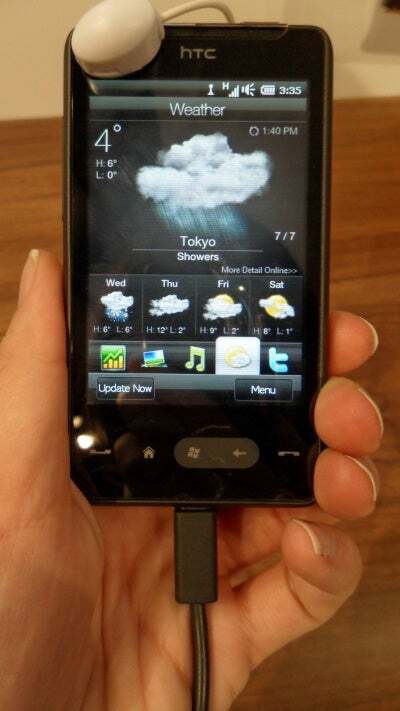 In terms of software, the Desire will run the updated HTC Sense, rather than the out-of-the-box Android 2.1 interface the Nexus One sports. Though the Desire has the same 480-by-800-pixel WVGA AMOLED display as the Nexus One, it somehow looks more brilliant. I think this is because HTC Sense is just so visually pleasing. Animations appeared fluid on the display and colors looked rich and vibrant. The Desire will be available in Europe and Asia around March or April from a number of carriers. 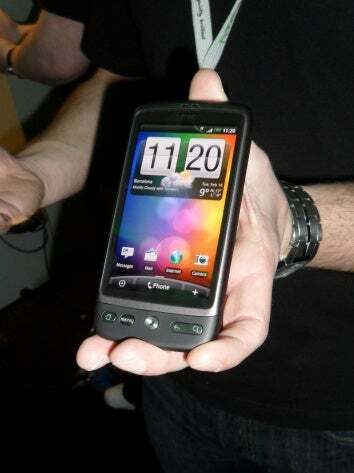 A smaller version of the gorgeous HTC HD2, the HD Mini sports a 3.2-inch capacitive touchscreen (as opposed to the HD 2's monolithic 4.2-inch display). In my opinion, the biggest draw of the HD2 is its generously-sized display so I don't really understand why HTC decided to release a smaller version. Still, the HD Mini's display is gorgeous and again, HTC really put some thought into its design. The HD Mini has exposed fasteners, giving it a sort of industrial look. And for whatever reason, HTC has given the HD Mini a bright yellow internal structure and battery. Like the Palm Pre Plus and Pixi Plus, the HD Mini can turn into mobile Wi-Fi hotspot for your computer or other wireless devices. HTC didn't give further details on how this would work in terms or data plans or pricing. The HD Mini will be offered in Europe and Asia by various carriers starting in March. Availability in North America has not been announced.